I know that that I am a person who encompasses juxtapositions. One such example occurred this past week: While trying to enjoy Berlin to the fullest before I leave in less than two weeks, I took the opportunity this weekend to go the Badeschiff – or the pool boat. I grabbed my go-to swimsuit, bought some sunscreen at the local Apotheke, and picked out a random book from my pile of “to-reads” and I was on my way. As Berlin is not close to an ocean, the Berliners have created sunning spots and swimming places on their lakes and rivers. This particular place is a beach bar - sand has been brought in so that the river bank resembles a beach and the ground is covered with people lying on towels enjoying the sun. If it gets a little too hot, you can take a break to dip into the pool – which is located on the Spree River on a boat. I settled myself in a beach chair, lathered up with sunscreen, and started reading. The author was a correspondent who traveled Indonesia extensively to report stories of the conflicts in the area which erupted during the late 1990s. 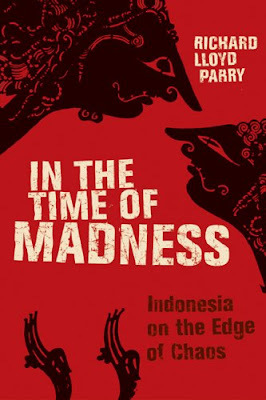 This book does not try to offer an overview of Indonesian society, but rather to provide a behind-the-scenes look at Lloyd Parry’s experience and the insights he learned about Indonesia while living there. Particularly, he discusses three main events which he experienced firsthand in his book: (1) the violent conflict between the Dayaks and the Madurese on the island of Borneo, which occurred between 1997 and 1999; (2) the 1998 resignation of President Sudharto, who had controlled Indonesian politics since 1966, on the island of Java; and (3) the UN presence during the election in which the people of East Timor voted for the island’s independence from Indonesia in 1999 and the following violence, in which no one was guaranteed safety. 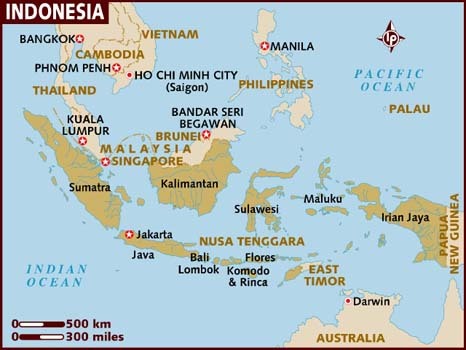 First, I want to share some geographic and demographic facts about Indonesia which were mentioned in the book. The country itself is made up of over 17,500 individual islands. The islands of Indonesia span the area from Great Britain to Iraq – an area so great that it makes it difficult for communication or for a shared national identity. Also, it is important to mention the diversity of people who make their home in Indonesia: “Its 235 million people were made up of 300 ethnic groups and spoke 365 languages.” (page 10) In 1945, following the surrender of Japan, Sukarno, who would become the first President of Indonesia declared the country’s independence. For the first two decades, unrest would be rampant – culminating with the 1965 and 1966 anti-communist massacres. In the midst of this unrest, Sudharto would come to power, bring tranquility, and in the next 30 years of his control, would bring development to the country. In order to create a basis of stability, Sudharto utilized the so-called Pancasila democracy, “a set of ideals under which Indonesians could unite whatever their race and faith: belief in one God; just and civilized humanity; national unity; democracy through deliberation; and social justice for all.” (page 115) Despite these ideals, Sudharto created a political atmosphere under his so called “New Order” which dominated the Indonesian political system without question for the following 30 years. Out of all of the points and all of the conflicts mentioned in the book, I found the author’s comments about Sudharto perhaps the most interesting. Unlike many other political leaders in Asia, he did not create around himself a cult of personality. When he resigned in 1998 following pressure from political and student groups, “there were no Suharto Avenues, Suharto Squares, or Suharto Mosques… there were no statues or public posters to pull down.” (page 169) I found it fascinating how someone could retain such strong control over a country as diverse in Indonesia without the media making him into a larger than life figure. Political scientists call this “performance legitimacy” and some have even called it “Suharto’s Law.” In short, “Indonesia’s political and intellectual poverty, the repressive security apparatus – these were accepted because, economically, Sudharto was a hero. However unhappy Indonesians were with their leader, there was no doubt that, under him most of them had become better off.” (page 122) Likewise, Sudharto had become much better off as well – with his family’s collective wealth estimated at 15 billion USD by the time he resigned. Although the conflict between the ethnic Madurese and Dayaks was of visual interest – the author describes with detail the “ugliness” of the conflict – complete with descriptions of decapitation, cannibalism, and Dayak warriors who are believed to have “invulnerability to bullets” (page 39), I found the description of the violence in East Timor more compelling. Both represent two sides of the same sort of conflict: trying to force a peaceful, functioning nation among disgruntled ethnic groups and peoples –who were either working to destroy each other or working for independence. Before I read this book, I knew nothing about the East Timor 1999 vote for independence from Indonesia. This voting was sponsored and supervised by the United Nations, however violence soon erupted from the pro-Indonesian militia to the point that UN employees and all foreign workers had to be evacuated for their own safety. Following this, the UN established a temporary government and peacekeeping force until 2002. The island of Timor “for arbitrary reasons of colonial conveniences, had been divided into eastern and western zones overseen by the Portuguese and the Dutch” (page 179) during the eighteenth century. Following 1974 when Portugal’s President was ousted, East Timor found its way into the hands of Indonesia, for political and security reasons. This was resisted by many of the natives of East Timor who resisted for decades under the so-called Falintil Movement. The island was finally given its choice for independence in UN-administered elections in 1999, and was approved by a large percentage of the population. Despite this, it was not a peaceful transition, as pro-Indonesia militias wreaked havoc on the East Timor population. Documents were later found that proved that the Indonesian military helped sponsor these militia groups, particularly by providing them with weaponry. Of course, this is problematic in many ways. One might start by asking, why? According to one East Timorese, “’Indonesia is a country made of islands. East Timor could be a small explosion that could lead to bigger explosions.” (page 192.) Another problem this poses for the western world is the support that we provide for the Indonesian military, which in turn provides support for groups which murdered and destroyed the communities of the people of East Timor. Many of the Indonesian military receive education and training in the West – particularly Europe, the United States, and Australia. I loved this review. Just saying.